Download "* 20 8 RN. 74 Guide Bars HERE S HOW THE OREGON SAW BAR. 12" 14" 18" 20" 36" (Etc.) 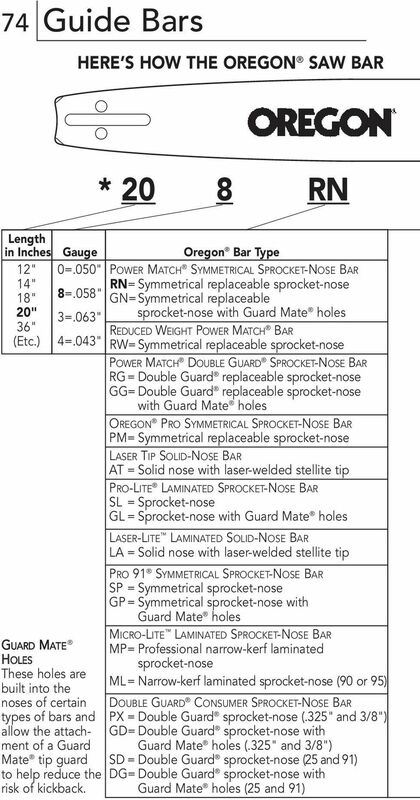 0=.050" 8=.058" 3=.063" 4=.043""
3 76 Guide Bars OREGON GUIDE-BAR TERMS CHAIN LEAD-INS GROOVE RAILS BAR MOUNT BAR-CHAIN OIL HOLE NOSE-ATTACHMENT RIVET HOLES NOSE SPROCKET GREASE HOLE NOSE SPROCKET TAIL BAR BODY REPLACEABLE SPROCKET NOSE NOSE RIVETS SOLID NOSE ARMOR TIP INTENZ BUILT-IN TENSIONING SYSTEM OREGON GUIDE-BAR-MAINTENANCE TOOLS SPANNER WRENCH FLAT FILE WITH HANDLE *Asst d. P/N s File P/N BAR RAIL DRESSER GREASE GUN P/N P/N s A, OR *Contact your Oregon dealer for part numbers, wrench sizes and other help selecting the right tools for your bar. 4 Guide Bars 77 IMPORTANT INFORMATION ON OREGON INTENZ GUIDE BARS Intenz bars are those which have our patented Intenz chain-tensioning mechanism built right into the bar itself. Read and follow the information about Intenz bars on this page, and provided inside the packaging sleeves of Intenz bars. Replacing the bar on saws currently equipped with an Intenz bar Chainsaws originally equipped with an Intenz bar do not have a "bar-adjustment pin" for tensioning the chain. And chainsaws which have been adapted to take an Intenz bar have had the bar-adjustment pin removed. Since these saws have no bar-adjustment pin: always replace an Intenz bar with another Intenz bar or the ability to tension the chain will be lost. Failure to tension chain WARNING correctly can cause serious injury to the saw operator or bystanders as a result of loose chain jumping off the bar. Do not use standard-type non-intenz guide bars on chainsaws without a bar-adjustment pin. Chain tension can not be maintained on a non-intenz bar without the mechanical stop provided by the saw's bar-adjustment pin. Replacing a standard bar with an Intenz bar An Intenz bar can be fitted to any chainsaw with a compatible bar-mount pattern. If the saw has a baradjustment pin, the pin must be removed. Carefully follow any instructions provided with replacement bars. 6 Guide Bars 79 BASIC GUIDE-BAR MAINTENANCE (CONTINUED) Turn nose sprocket while pumping grease until whole sprocket has new grease. Do not push dirt into the hole. 90 With chain on the bar, hold a straightedge against the bar body and against a cutter side plate. A good groove will hold the chain straight, leaving a small gap between the straightedge and bar body. A worn groove will let the chain lean until straightedge is flush with bar body. Replace bar if groove is worn. On sprocket-nose bars, check for clearance around the bar s tip between the tops of rails and the bottoms of cutters or tie straps. Replace nose sprockets before cutters or tie straps contact the bar rails. 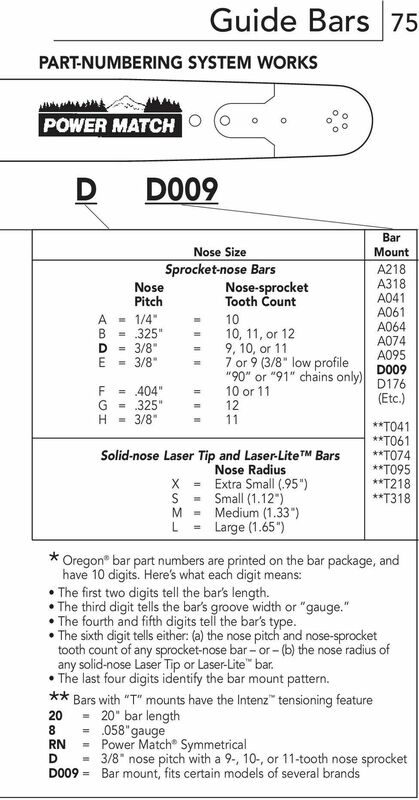 7 80 Guide Bars HOW TO REPLACE OREGON POWER MATCH BAR NOSES NOTE Select a new Power Match nose with the correct pitch for your bar and chain. Reduced-kickback Double Guard replacement noses can be installed on any Power Match bar and can be used with the same drive-link-count loop of chain. 1. Each Oregon Power "X" Side Up Match bar nose is marked, on one side only, with an X. Always strike on the X -stamped side of Power Match bar noses. Striking on the wrong side will damage the nose and bar body. Use a punch that will fit through the nose-rivet hole as shown to drive out the single attaching rivet. 2. Remove the old nose. Clean the bar s attachment area. "X" Side Up 3. Insert the new nose into "X" Side Up the bar body. Insert the Power Match rivet (part no ) through the underside of the nose, opposite the X mark. NOTE The rivet will not fit, and cannot be secured, if inserted through the X side. 8 Guide Bars 81 POWER MATCH BAR NOSES (CONTINUED) 4. With the bar body, nose, and rivet solidly supported on a strong flat metal surface, peen the Power Match rivet s head down with the flat end of a hammer. Do not hit the bar body, hit only the rivet head. Strike only on the X side. To check installation, grip the bar body in one hand, the nose in the other hand, and twist. Nose and body should feel like a single, solid piece. If not (if any movement in the nose-bar joint area is felt or if any clicking sound from the same area is heard), tighten the rivet with a few more hammer strokes. 5. File down the rails of new noses to align with the rails of old bar bodies. 6. Grease the new nose sprocket. Pump grease into holes until excess grease appears around the nosesprocket teeth of the guide bar. 10 Guide Bars PRO-LITE /MICRO-LITE PRO NOSE SPROCKETS (CONTINUED) 4. Once fully inside the nose, hold the sprocket in place, then remove the tissue Align the sprocket s innerrace holes with the holes in the bar nose. Insert rivets into each hole through the bar. On used bars the nose rails may tend to spread apart. Use a small clamp to hold the nose rails together when inserting and securing the rivets. 6. With the bar and rivets solidly supported on a strong, flat metal surface, carefully peen the rivet heads down with the flat end of a hammer. Be careful to hit only the rivet head. Do not hit the bar body this will pinch the nose sprocket. Rivet heads must be snug and secure while still allowing the sprocket to turn freely. 7. Grease the new nose sprocket. Pump grease into hole until excess grease appears around the nosesprocket teeth of the guide bar. 13 86 Guide Bars GUIDE-BAR TROUBLESHOOTING (CONTINUED) REMEDIES: (T-Y) T. Shallow grooves and wire edges are the result of inadequate lubrication, improper tension or normal wear over time. Use a flat file to square up the bar s rails and remove wire edges promptly. Left alone, wire edges can break off, chipping away good rail material. This remedy applies to pictures 29 and 30. U. 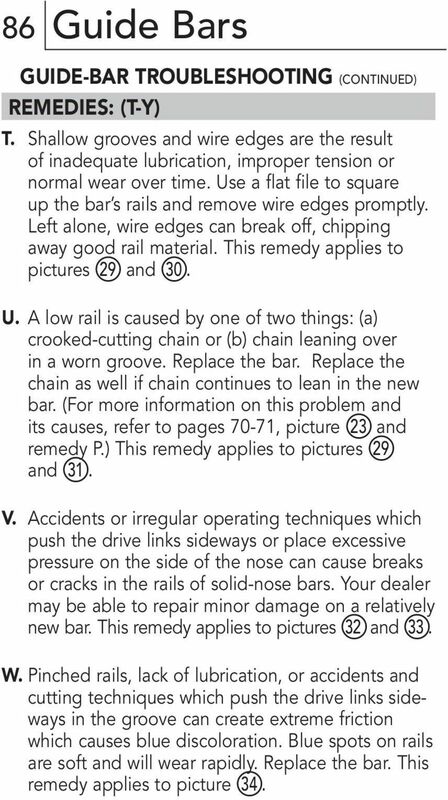 A low rail is caused by one of two things: (a) crooked-cutting chain or (b) chain leaning over in a worn groove. Replace the bar. Replace the chain as well if chain continues to lean in the new bar. (For more information on this problem and its causes, refer to pages 70-71, picture 23 and remedy P.) This remedy applies to pictures 29 and 31. V. Accidents or irregular operating techniques which push the drive links sideways or place excessive pressure on the side of the nose can cause breaks or cracks in the rails of solid-nose bars. Your dealer may be able to repair minor damage on a relatively new bar. This remedy applies to pictures 32 and 33. W. Pinched rails, lack of lubrication, or accidents and cutting techniques which push the drive links sideways in the groove can create extreme friction which causes blue discoloration. Blue spots on rails are soft and will wear rapidly. Replace the bar. This remedy applies to picture 34. 14 Guide Bars 87 GUIDE-BAR TROUBLESHOOTING (CONTINUED) REMEDIES: (T-Y) (CONTINUED) X. Such wear or chipping near the nose often accompanies heavy limbing, but can also be caused by loose chain tension. Invert the bar on the saw periodically to reduce such wear. 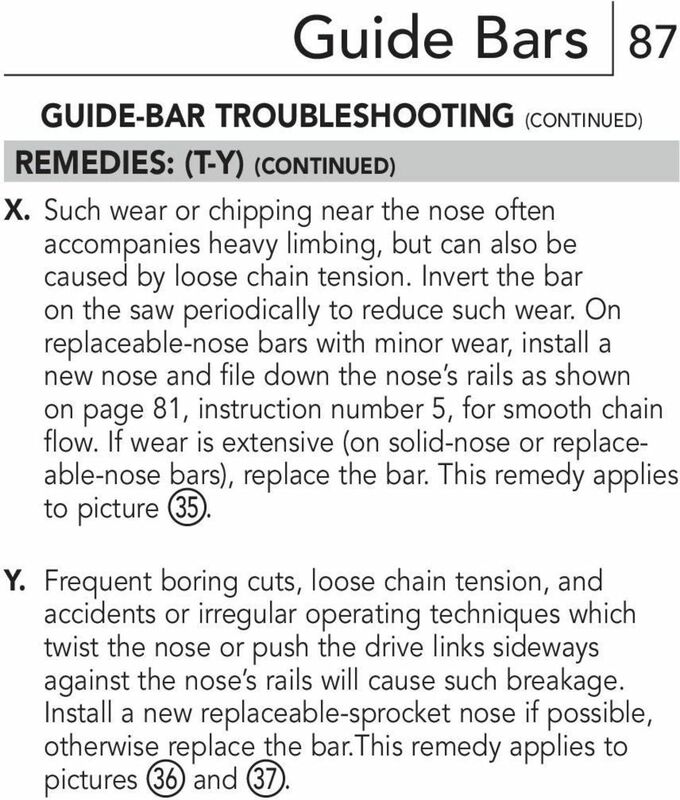 On replaceable-nose bars with minor wear, install a new nose and file down the nose s rails as shown on page 81, instruction number 5, for smooth chain flow. If wear is extensive (on solid-nose or replaceable-nose bars), replace the bar. This remedy applies to picture 35. Y. Frequent boring cuts, loose chain tension, and accidents or irregular operating techniques which twist the nose or push the drive links sideways against the nose s rails will cause such breakage. Install a new replaceable-sprocket nose if possible, otherwise replace the bar.this remedy applies to pictures 36 and 37. WARNING Read Rules for Safe Operation and Installation Carefully. Prevents Rotational Chain Saw Kickbacks when Properly Installed. Table of Contents. www.hunterfan.com. What to Expect with. Preparation. Tools Needed. Wiring. Hanging the Fan. Blades. Motor Housing. The picture is a look at the rings set in the light shows the rings in the low powered or light loads. Belt Tensioning Methods for Small Package Conveyors What s the best solution? FJ2 2 Ton Trolley Floor Jack Assembly & Operating Instructions READ ALL INSTRUCTIONS AND WARNINGS BEFORE USING THIS PRODUCT. This manual provides important information on proper operation & maintenance.